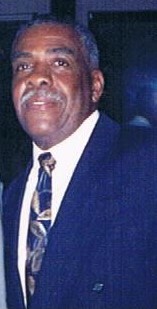 Freddie Linwood Burks, Sr. was born January 20, 1935 in New River, Virginia to the late William Garrison Burks and Ella Rollins Burks. On January 16, 2018 Freddie L. Burks, Sr. was called home to receive his reward as Jesus promised, “I will come again and receive you unto myself; that where I am, there you may be also”. Freddie retired from (Western Electric) Lucent Technology after he worked there for 30 years. He is also a former member of Ebenezer Baptist Church. Freddie touched lives of many, and he helped anyone that was in need. Freddie was known to many young people as “Grandpa”, or “Mr. Burks”. Freddie was a mentor to you men offering advice and guidance. He loved sports, was athletic, and coached in the community where he lived. He was a very skilled person who was known for his ability to repair, create, or build anything with his hands. He leaves to cherish his memory, his devoted with of 53 years Anne; his sons, Marcus L. Burks, Byron D. Burks, and Freddie L. Burks, Jr.; six grandchildren, Tyra, Jarrell, Antwan, Amari, Jordan, and Brionna; and seven great grandchildren. He is also survived by his sister Emily Lacks or New River, Virginia; brother, Ira Wallace of Baltimore, Maryland; and a host of many relatives. He is preceded in death by his sisters, Ethel Burgess, Dorothy Martin, Rachel Burks, Ella Kate Hayden, and Irene Burks; brothers, Robert Burks, Abraham Burks, Hugh L. Burks, Kenny Burks, and William G. Burks. Freddie has many loved ones including friends and family that loved him dearly, who will miss him greatly and treasure his memory. Visitation 11:00am and Funeral 12:00 noon Thursday January 25, 2018 at MARLAN J. GARY FUNERAL HOME, THE CHAPEL OF PEACE EAST 5456 E. Livingston Ave.
Offer Condolence for the family of Freddie Linwood Burks, Sr.
Online Obituary Donation in memory of Freddie Linwood Burks, Sr.